Caffeine is our morning crutch when we stay up too late and sleep too little. It's common for us to make two trips (okay, three, if we're being honest) to the coffee maker each day. It's the quickest way to wake up and get things done. 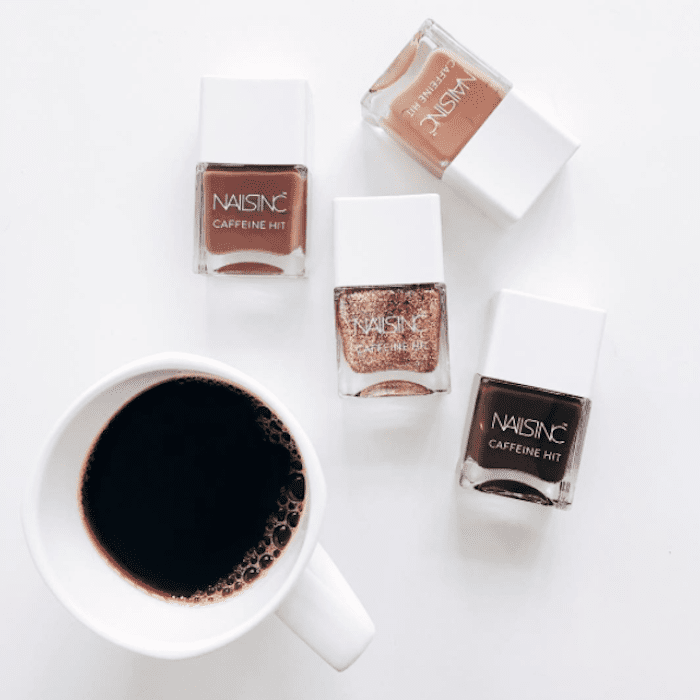 According to Nails Inc., caffeine does the same thing for our nails that it does for us. The cult-favorite polish brand says that the active ingredient promotes nail regeneration to make them stronger and healthier, and that's why it just launched a line of caffeine-infused nail polishes. In broody brown and taupe shades, the polish matches your daily Starbucks order (just think of all the Instagram opportunities). There are four shades in the Caffeine Hit collection. Espresso Martini ($11) is the darkest of the four; it's a true dark brown. Then there's Afternoon Mocha ($11), which is a perfect combination of brown and pink (it almost looks like creamy milk chocolate). Chai Kiss ($11) is a rosy-taupe color, and Rise and Grind ($11) is a super-pretty sparkly shade. So not only will your nails be right on trend with fall's go-to tones, but they could potentially grow longer, stronger, and healthier as well. The collection doesn't end at nail polish, either. Nails Inc. also has a hand-and-foot Coffee Scrub ($15) that will slough away dead skin for smooth results. You can get this coffee scrub on its website. As for the rest of the polish, you can find it on the Nails Inc. website or at any Sephora. Next, read about the best Korean skincare brands, according to experts.